Those of you who were wondering what the thorny green-and-purple plant here was, I asked about it on Metafilter. 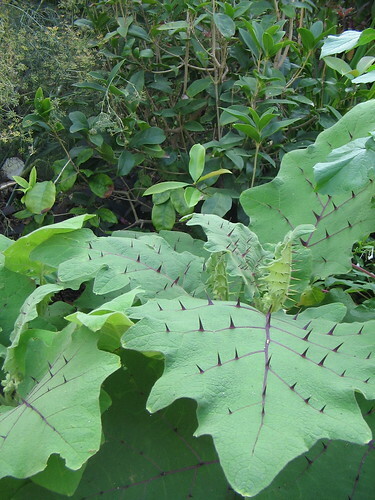 It’s called the Bed of Nails plant, or Naranjilla in Central America, scientific name Solanum quitoense. I don’t think I’ll be growing any of those soon, as they would probably be a literal pain to repot. Just like a cactus plant, you repot it with the help of a newspaper. Take a page from a newspaper, make a fold a couple inches from the edge, then fold again and again until you’ve used up the page. Wrap this “strap” around the stem of your spiky plant: now your plant has a handle. I just got one of these plants because I think the leaves are quite striking. Do you know where I might get one from. I see ads for seeds but they are not the leaves with the thorns.